1One of the great strengths of the Internet – and one of the great strokes of luck for its users – was that self-regulatory mechanisms were in place from the very outset. These mechanisms proved all the more effective for being developed collaboratively. And so the term netiquette, or “net-etiquette”, was coined in 1995. Netiquette refers to a behavioural protocol that defines what one must not do on certain networks or within a certain context. Initially developed for discussion forums on Usenet – one of the forerunners of the modern-day Web – netiquette meant avoiding sending promotional or anonymous messages or the same one several times. The protocol also recommended that users sign messages with their real name. 2Given the constant evolution of identity issues, and above all the speed at which reality sometimes seems to catch up with even the most Orwellian scenarios, we may need to consider how Isaac Asimov’s famous “Three Laws of Robotics” could be adapted to the task of preserving our digital privacy. A terminal or object connected to the Internet cannot archive, collect or transmit data relating to a human being after an explicitly defined point in time, nor, through inaction, can it allow for each and every human intention or behaviour to be indexed. A terminal or object connected to the Internet must obey the privacy rules chosen by the user, unless such rules are in conflict with the first law. A terminal or object connected to the Internet must offer personalised services, so long as these services do not conflict with the first or second laws. 3Lastly, here are four fundamental principles, or pillars, which can help us anticipate or avoid the main “risks” stemming from online exposure. 4Owning your own domain name will always be a plus. Very often it will prove useful when you join the professional world, for example, or should you choose to publish content online, regardless of what that content is. Even if you have no intention of publishing anything at all on the Net, owning your own domain name at least allows you to protect yourself from seeing your name misused or appropriated by someone else. 5Depending on your relationship to the online world, and the time you devote to it – whether willingly or because it is part of your work – it is also useful, even essential, to set up an account in your name on the most fashionable services. For example, an individual might open a personal or company Facebook or Twitter page in order to avoid identity theft or the nuisance caused by another user taking their name. 6When it comes to digital identity, your privacy is determined by the settings you choose. Yet leading Web players, first and foremost Facebook, have mastered the art of changing their settings or the terms and conditions associated with their sites or affiliated applications/services several times a year. Every time we sign up to a service, we need to thoroughly check that the information we are sharing corresponds to what we ourselves would have chosen, and that it will remain within our control. It is also necessary to regularly double check our online settings, and to make changes if necessary. 7In professional life but also, increasingly, in family or private life, too much online presence or exposure is often preferable to too little. 8The desire to maintain control over one’s identity or digital reputation naturally implies at least minimal surveillance of one’s name or brand. It is also important to bear in mind the – sometimes vicious – circle whereby increased publishing activity or online presence naturally leads to increased exposure, which in turn increases prominence and entails a heightened need for tracking and surveillance. 9Preamble: The Web is not a private space. However the question is framed, it is simply not possible to defend some notion of private life online. At most we can control the perimeters of our online activity and digital discourse. 10One: Express one’s opinions using one’s own name, if that is possible and does not contravene the rules of one’s profession or employer. 1 See Journal d’un avocat, http://www.maitre-eolas.fr/. 11Counter-example: the famous blogger–lawyer Maître Eolas is obliged to blog under a pseudonym. Both because this allows him to voice very strong political opinions that might otherwise deprive him of the custom of clients who do not share the same views, but above all because practising lawyers are forbidden to promote a particular law firm, which the reputation of his blog could easily be perceived as1. 12Two: Provide information deliberately, where this is necessary (for example, to sign up to a site), and provide only what is strictly required for “administrative purposes” (your name and address, and possibly your telephone number). Do not under any circumstances provide details that risk revealing information about your personal or private life (such as religious affiliation, sexual preferences or political opinions). 13Example: though Facebook requires new users to tick boxes about their political, sexual or religious standpoints, there is nothing to stop users subverting these or not taking them seriously. “Wire Fox Terrier” is this author’s political preference on Facebook. 14Three: Opt for tools that have clear and readable data-privacy policies (Facebook’s guidelines take longer to read than the American Constitution …). Equally, opt for open-source tools rather than proprietary tools or networks. 15Example: the micro-blogging site Twitter has an open-source equivalent called identi.ca (http://identi.ca). 16Four: Choose the tool or networks most suitable for your needs. 17Examples and counter-examples: Facebook is not a site for sharing CVs. Nor is it a dating site (even though many people use it to meet people). If you want to date, network or share holiday photos and videos, use sites that were created for those purposes. 18Five: Prioritise networks and keep personal and professional relationships separate. 19Example: use Twitter to share information with friends and/or colleagues, a Facebook account for your professional network and a blog to “publicly” express your views, opinions or expertise. Or, if your “friends” use Facebook more than Twitter, use Facebook with friends and Twitter with colleagues. Basically, do what you want but don’t invite your boss, your mother and your mistress round for coffee at the same time. 20Six: Don’t worry about having several profiles. As soon as a person has a degree of social status or decides – notwithstanding the previous point – to concentrate their activity and relationships on a single site or network (Facebook, for example), it’s better to have separate “personal” and “professional” accounts or profiles. 21Seven: Be aware that anything you say will be associated with the social position you occupy when you say it as well as with the rules that come with that position, but that it will most probably remain visible even when changes to your social position (and/or institutional affiliation) recontextualise what you have previously said. Governments are working to make information data collected by search engines and/or social-networking sites anonymous. But nothing can anonymise anything you say in your own name. Consider starting from scratch, that is to say deleting information or accounts and creating new ones whenever this is necessary (when you start working or change employer, etc.). In other words, before saying something, think hard about the “decontextualisation potential” inherent in some remarks. 22Eight: Be aware that digital identity is just one side of our digital social selves. Our friends, relationships and networks in themselves are constituent and determining parts of our digital identity. Take great care in choosing them. 23Nine: Being present online means being really present. Profiles, accounts and services must be regularly updated. Close any accounts that you are no longer using. And decide how interactive you are prepared or able to be on each service. 24Example: open, close or modify comments on your blog in advance or retrospectively; select which friends can view your photos on Facebook; regularly update your CV or contacts on a professional network. If you do have to use several services and cannot be permanently connected to them, set up email or RSS alerts to stay informed about any activity on one of those services. 25Ten: Reread and apply the four pillars of digital identity! 26Cultivate your garden: The dream of cultivating a digital identity that resembles a garden à la française, with its own structure and carefully bordered floral beds, risks becoming a Utopia given the proliferation of some tools and the extreme concentration of others, two trends which, in the end, amount to the same thing. For readers receptive to this horticultural metaphor, the only advice we can give is to ensure that their digital-identity garden does not go wild or lie fallow for too long. And, above all, never allow anyone other than yourself to take responsibility for tending and organising that garden. That being said, it’s impossible to ward off every bad crop or climate disaster, as any gardener will tell you. ERTZSCHEID, Olivier. 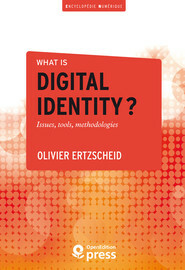 Appendices In : What is digital identity? Issues, tools, methodologies [en ligne]. Marseille : OpenEdition Press, 2016 (généré le 19 avril 2019). Disponible sur Internet : <http://books.openedition.org/oep/1383?mobile=1>. ISBN : 9782821855793. DOI : 10.4000/books.oep.1383. Ertzscheid, Olivier. “Appendices”. What is digital identity? Issues, tools, methodologies. By Ertzscheid. Marseille : OpenEdition Press, 2016. Web. <http://books.openedition.org/oep/1383?mobile=1>.